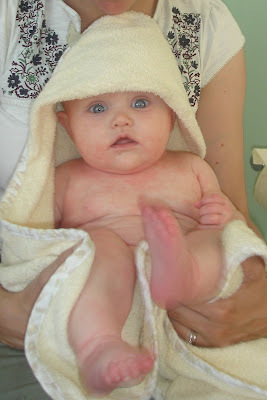 ThingOne is getting over the chicken pox. She's still very spotty all over, but the no new blisters are appearing and this should mean that she's no longer contagios and so can (much to Anne's joy) go back to nursery. Another reason we can tell she's getting better is that she's very grumpy and is throwing tantrums. When she's ill she tends to get very sleepy and cuddly. When she's on the mend she gets up and down, leading to horrible mood swings. 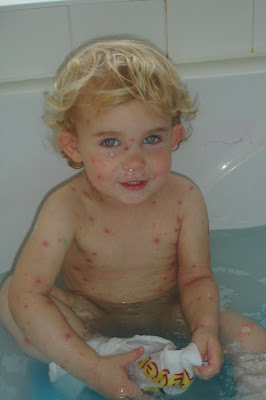 We do sympathise as it must be horrible for her having chicken pox. She seems to find it a bit more bearable when I tell her she's now like Bottomly Potts. In contrast, ThingTwo's entering a really cheerful stage. She's coming alive nicely, and starting to interact more. Apparently she's rolling over a fair bit, but I've yet to see that.